SLEEP UNDER THE STARS AND OBSERVE THE MILKY WAY! One cannot plan to become a professional of the outdoor hotel industry overnight! With our partner BubbleTree, you get the guarantee of a bubble tent meeting the French safety standards. 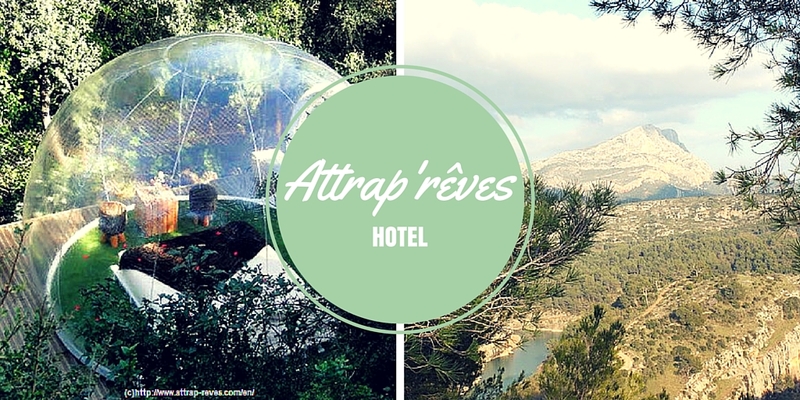 With Attrap’Rêves, you get the guarantee of excellent service: a dynamic team at your service to make your stay unforgettable! A cozy cocoon to rediscover the nights under the stars but without the drawbacks: goodbye humidity and exit small flying and crawling insects! An ingenious concept you can enjoy all year long even with bad weather! Each bubble has its own identity and the decor varies depending on the ambiance you want: Zen, Love Nature, Glamour, 1001 nights or Chic & Design. And your intimacy is completly protected. A habitat designed entirely with recyclable materials to create interactivity and live a unique experience. The sphere is maintained by a silent blower which allows fresh air in continuously. It requires a power source which represents no more than 55-watt. At the end of the season, the bubble is deflated without any impact on Mother Nature. – Private showers and toilets for each bubble. Towels, shower gel and shampoo provided. – Private parking for each bubble. – Picnic and pets are forbidden. To discover or improve your knowledge of the Milky Way, Attrap’Rêves provides youwith a telescope and a star chart (soon the moon craters will no longer have secrets for you). Moreover, in its quality approach, Attrap’Rêves has selected local partners (caterer, masseuse) to make your stay as comfortable as possible.